The great American floral artist Georgia O'Keefe once said "I hate flowers, I only paint them because they are cheaper than models and they don't move." I could personally say the same about painting fruit and still life, I don't normally get inspired by this kind of subject but for once I thought I would give it a try. 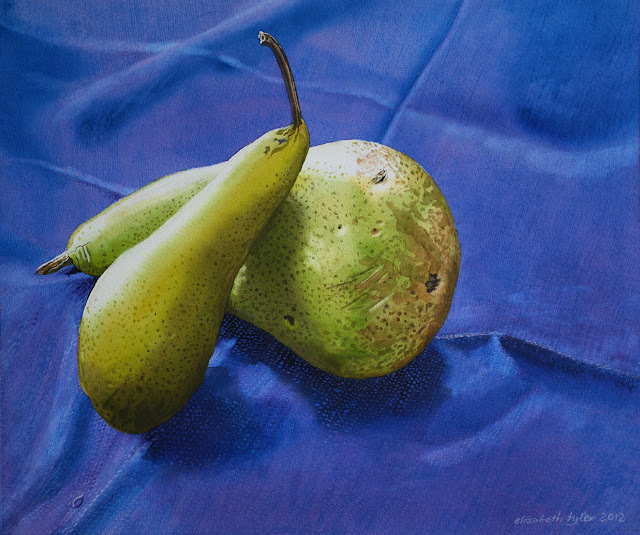 I ended up enjoying describing the surface of the coarsely woven fabric as a background for the soft smooth pears catching the light and casting soft shadows. The tablecloth is painted firstly with prussian blue and then with a thin layer of magenta. The pears were painted with yellow before adding sap green and finally burnt sienna.